Nothing matches the value of putting your organization’s branding on a retail water bottle. That’s why we offer several from Camelback and Contigo. However, buying a brand name bottle comes at a premium, so that’s where our h2go water bottles comes in. The line offers on-trend designs, high quality, and a lower price. The h2go Swig Insulated Bottle, the focus of this staff review, retains hugely popular retail styling—and quality—but with budget-consciousness in mind. The h2go Swig Insulated Bottle has a sleek, eye-catching appearance. It fits well in most standard cup holders and is designed for stability (read: no more tippy water bottles!). Despite its smaller size, the sturdy design makes it a great pick for our staff tester. This bottle is made from quality 18/8 stainless steel and is vacuum insulated. The threaded, stainless steel lid is also insulated, which means your liquids stay cold (or hot) for extended periods of time. Around here, any insulated water bottle is a favorite water bottle! And our tester loved that it was just like the bottles she sees in national stores, and worked just as well for keeping her liquids at temperature. This downside to the Swig’s popular design is that it has a narrow opening, which (like LOTS of bottles) requires that you use a bottle brush to clean. Our staff tester prefers bottles with wide openings that she can get her hand into, so this design was definitely not one she prefers. She said she really dislikes doing dishes of ANY kind, so a water bottle is at the bottom of her list of things that need to be handled with care! 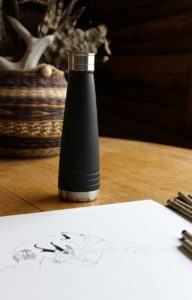 That aside, she thinks our h2go Swig Insulated Bottle is stylish and looks beautiful in any setting. It’s an eye catcher that comes in lots of great hues, and is ideal for a chic lifestyle.